This focuses on muscular pain, injuries, tension, stiffness and any problem areas. The massage can be a full body, however, the therapist will target the areas that need the most work: often the shoulders, back or legs. Not only kitesurfers will benefit from this treatment, but also everyone who carries stress and pain from day to day life. Each session is preceded by a short consultation in order to tailor the massage to the client. Adding the vacuum therapy cupping speeds up the healing process. Cupping is an ancient Chinese method of causing local congestion. By means of heat a vacuum is created inside the cup placed on the skin. This draws up the underlying tissues. When the cup is left in place on the skin for a few minutes, blood stasis is formed, this triggers the immune and lymphatic system to work on this area and localised healing takes place. Cupping therapy has been also developed as a means to open the ‘Meridians’ of the body. Meridians are the conduits in the body through which energy flows to every part of the body and through every organ and tissue. There are five meridians on the back that, when opened, allow invigorating energy to travel the whole length of the body. It has been found that cupping is probably the best way of opening those meridians. WHICH PARTS OF YOUR BODY ARE AFFECTED BY KITESURFING? Kitesurfing is a physically demanding sport, it is important to take care of your body if you want to get the best performance and improve your riding. High demands on the quadriceps (front of thigh), as the knees are often bent, putting you in a static contraction for the whole period you are riding. The hamstrings (back of thigh) and gluteals (buttocks) are also acting as global stabilisers. Core and back strength plays a huge role as, even in light winds, kitesurfers are working with huge dynamic forces pulling in all directions. Light winds will demand as much trunk rotation as possible to maintain your edge and your position on the water. Strong winds will create more bar pressure (pull), and it will demand a lot more of the shoulders and latissimus (back and side of the trunk), arms – including forearms and wrists – in order to maintain control. At every level of kiting, the neck takes the brunt of falls and mistakes, with strain to the neck flexors (front and side of neck). As with any sport, over time, training hard can make all of these areas prone to tension and tightening as the body’s soft tissues – muscles, tendons, ligaments – become shorter and less elastic. Pepe started competing in professional weight lifting at the young age of 15. After a successful career spanning 4 years, including the award of a bronze medal at the Polish National Championships, Pepe sustained a serious back injury which prevented him from continuing in this sport. The injury sparked a passion for alternative medicine, massage, functional training and general wellbeing. Since then, Pepe has been travelling the world in search for an inspiration and new techniques in various countries such as India, Poland, Slovakia, the UK, Ukraine and the USA. 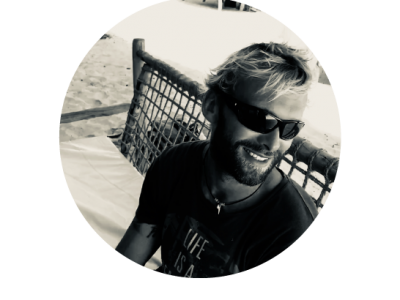 In a recent years, being a Kitesurfing Instructor, he is focused on problems that kitesurfers experience with their bodies after long hours of practicing.